These world renowned rasps from our small forge in France are available through selected retailers in the USA, Canada, the UK, Australia, Norway, Sweden, France, The Netherlands, Austria, Germany & Australia. We do not sell to individual customers direct from our forge as we are simply too busy making tools but you can buy on this web site which is managed by our brilliant UK outlet Classic Hand Tools who stock just about everything and ship worldwide. Since re-starting his factory in 2008 with essential and considerable help from Classic Hand Tools (UK) and Magma (Austria), who just couldn't bare to let this legendary business die, Michel Auriou is making a wide range of rasps and rifflers for wood and stone with a strong team of skilled blacksmiths and rasp stitchers. In 2017 ownership of the business became French again with both CHT & Magma reverting to approved stockist status having succeeded in saving the legendary rasp making business in very turbulent and difficult trading times. Bravo! 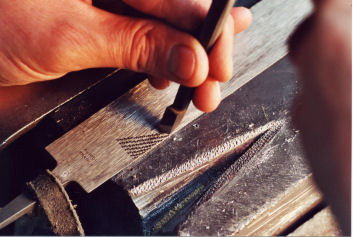 Michel's very skilled blacksmith and grinders are also producing 40 carving tools under the design and tutelage of British Master Carver Chris Pye. They also make firesharp stonecarving tools. All tools are all produced in house at Forge de Saint Juery, home of Auriou Toolworks, near Albi in south west France.